Here's a glimpse of what it looks like in cities and towns across the country as public schools starved for funds and resources are taken over and privatized by for profit charters. Different faces, different places, same story. Here's some reporting you won't find on the evening news. Editor Comment: Having attended Monday night’s School Reform Commission meeting, I have several observations I would like to share. It is clear that the privatization juggernaut is moving full steam ahead unimpeded in Philadelphia. It feels like the corporate forces that have invaded Philadelphia are like a giant icebreaker plowing through the district unimpeded leaving us to futilely throw rocks at it as a protest. The words “union contract” were not mentioned in the SRC meeting. If a stranger attended the SRC meeting, they would have no clue that there is a stalemate with the Philadelphia Federation of Teachers and the SRC is content to let the school district employees twist in the wind with an uncertain future even has school employees must daily deal with horrendous conditions of huge class sizes over the contract limit and no counselors and other support staff. Outright violations of state and federal law are becoming routine in such areas as Special Education. The meeting was poorly attended. Only twelve speakers signed up to speak and four of them did not attend. There were two excellent speakers, a leader of school counselors and a parent who shouted in the darkness to no affect. The counselor spoke of the absurd conditions the few remaining itinerant counselors must work under with no support whatsoever. Most serve eight schools and must go to two schools each day. Just the travel time of moving between two schools in the same day makes their job absurd. Each counselor is supposed to serve thousands of students. She mentioned that the counselors are given no laptops or cell phones to keep in contact with their schools and record information. Superintendent Hite picked up on this one comment to mumble something about maybe they could look into technology for the counselors. About the conditions the school must deal with since there are no counselors there was no comment. The parent voiced her frustration at parents being ignored and shut out of the any input into what is happening to the schools. There was not comment from the SRC. The demeanor of the SRC members was cold-hearted indifference and an attitude of we are on course, full steam ahead. Most of the meeting was spent on business matters such as thirty-five minutes devoted to a discussion of which real estate tax abatement program would be best to save the district a million dollars (as if this made any difference in a district with a $300 million deficit). Multi-million dollar contracts were allocated for testing companies such as $4,259,115 to Pearson Learning and Renaissance Learning for technical support and staff development for “Universal Screeners for Response to Instruction and Intervention” (no public explanation given). The meeting was all about business and technology. Actual education was never mentioned. Five years ago Superintendent Arlene Ackerman announced Imagine 2014. It was presented as some benign expansion of charters. 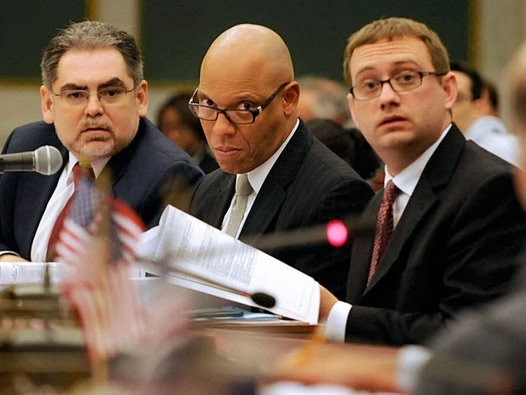 It is now clear that this was a five-year plan for an undemocratic seizure of the public schools of the Philadelphia School District by private interests done in great secrecy and with deception. Since the state takeover in 2001, the Philadelphia pubic schools have been starved for funding even as the charter sector was increasingly built up, until we now arrive at this year’s “Doomsday budget”. Now the slow starvation has become a complete denial of life support for Philadelphia’s public schools. Education Secretary Arne Duncan infamously said the Hurricane Katrina was the best thing that ever happened to New Orleans because it allowed the privatization of New Orleans public schools which are now 90% charters. Eli Broad is notorious for saying, “Never let a crisis go to waste.” The difference between New Orleans and Philadelphia is that our crisis is completely man-made. This has been a crisis deliberately created by corporate education reform to advance a privatization agenda. The only way to turn this around is for an informed citizenry to rise up against it. The problem in Philadelphia is that the majority of people are uninformed due to corporate media. Yesterday I linked an interview in the Philadelphia Inquirer with the head of the SRC Pedro Ramos. It was a pathetic pandering article praising him for the job he is doing despite being opposed by a vocal minority of teachers and students. This Inquirer column typifies the problem in Philadelphia. If people do not seek independent sources of information on the internet they are clueless about the reality of the disaster unfolding in Philadelphia public schools. In the last few weeks the Philadelphia Inquirer has reduced its Opinion and letters pages by 50%. In its place we get journalism such as the interview with Ramos which can only be characterized as propaganda advancing a corporate agenda. In the case of philly.com, the owner of the Philadelphia Inquirer and Daily News, it must be kept in mind that one of the co-owners, H.F. “Gerry” Lenfest, is an outspoken supporter of charters. His son, Brook Lenfest, is heavily invested in the Mastery charter management company. In 2009, H.F. Lenfest’s Lenfest Foundation announced a $10 million matching grant to expand Teach for America in Philadelphia over ten years. TFA said it was “the largest grant offer a regional Teach for America program has ever received”. This is the reason why I must continue to do the Pennsylvania Education Crisis Highlights digest. It is my attempt to shine a light into the darkness we are living in.